The budgeting tool is good, though it lacks some of the nuts-and-bolts guidance novices need. The brainchild of former PayPal and Intuit CEO Bill Harris, Personal Capital will help you budget and track monthly expenses, savings, and debt, but its real focus is investments. Still, there’s plenty here for household budgeters who just want to better manage their spending and sock away some money for college, retirement, or that dream vacation. Personal Capital is really two tools: a free personal finance manager and a paid investment management service. 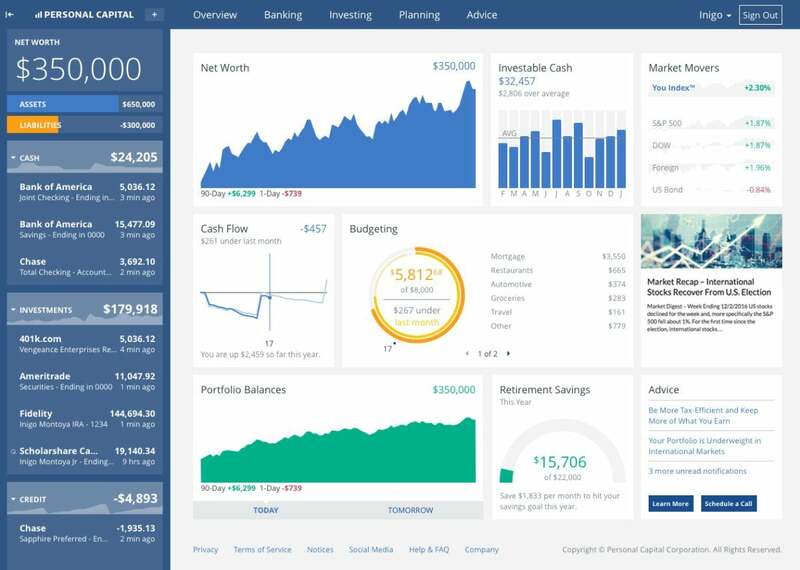 The personal finance manager, which we reviewed, allows you to keep tabs on your income, spending, assets, and investments from a single portal. Once you log in and link all your financial accounts, Personal Capital aggregates all the data on your dashboard. In a clean layout of graphs and charts, it gives you an at-a-glance overview of your net worth, investable cash, cash flow, top spending categories, portfolio allocation and balances, and a stock market snapshot. Clicking any one of these categories takes you to a more detailed analysis. 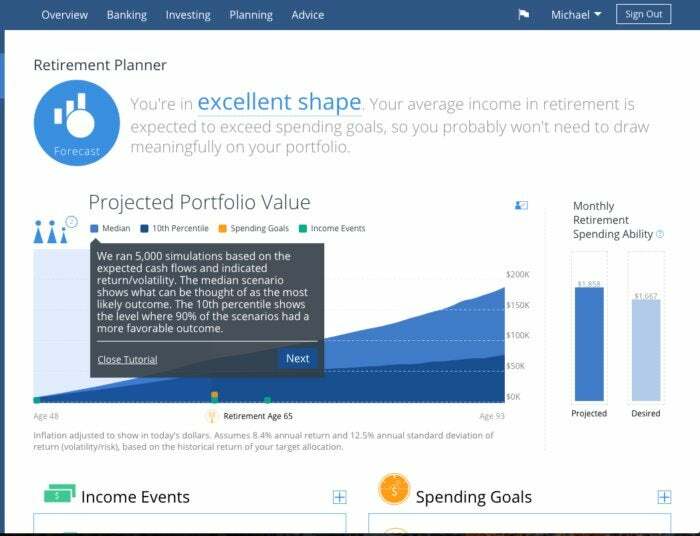 Personal Captial’s retirement planner shows you where you stand relative to your goals. As far as budgeting is concerned, Personal Capital provides plenty of transparency into your money’s movement. It tracks your balances and transactions in real time, generates income and spending reports, and breaks down expenses by account and category. Armed with this information, you’re undoubtedly better able to plan how to spend and save your money if you have some experience with using a budget. But Personal Capital doesn’t include the kind of hands-on tools for allocating income to specific categories that would help newbies learn the nuts and bolts of budgeting. In fact, Personal Capital’s budgeting tools feel dwarfed by its investment features. These include a retirement planner that shows you where you stand relative to your goals based on data it pulls from your linked accounts; an “investment checkup,” which analyzes your portfolio allocations and helps rebalance them to maximize returns and minimize risk; and a feature that ferrets out costly hidden fees in your mutual fund, investing, and retirement accounts. While a free account is plenty for do-it-yourself money managers, if you have $100,000 or more in investments you can sign up for Personal Capital’s wealth management service. You’ll receive access to a team of registered financial advisors who will help you put together a personalized investment plan. The fee is based on a percentage of your deposit amount. By aggregating and analyzing all your accounts in one place, Personal Capital provides the most comprehensive view of your expenses against your earnings. If you just want to track your monthly income and outflow, Personal Capital is probably overkill. But those interested in managing—and growing—their money over time will find plenty to love here. Personal Capital's free budgeting tool can help you follow your money, but this app is designed with affluent investors in mind and lacks some of the nuts-and-bolts guidances novices need.